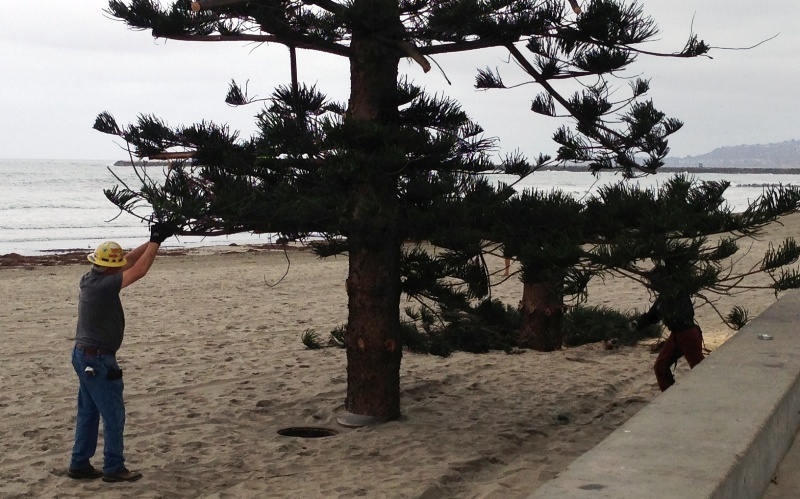 It’s officially the holiday season in Ocean Beach: The OB Christmas tree has been planted in the sand. 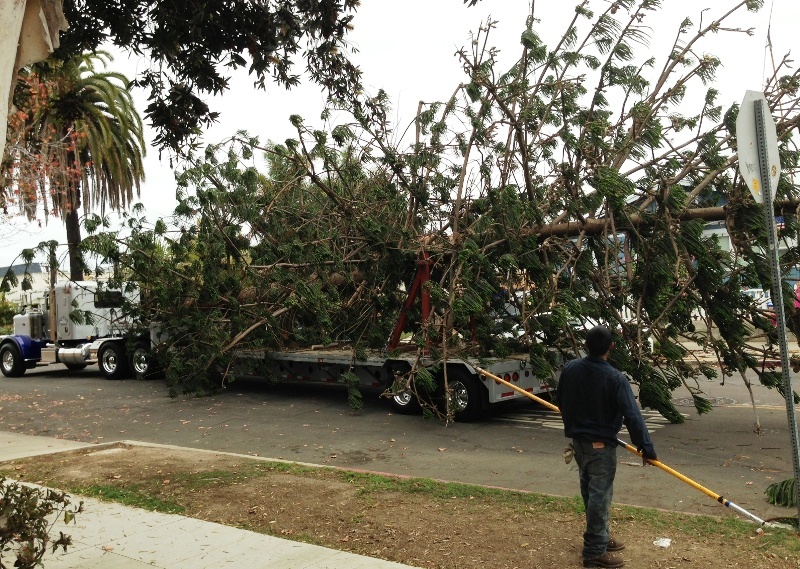 The 60-foot-or-so star pine was cut down Tuesday morning from the yard of the Kuhn family at 4879 Coronado Ave. and transported with much fanfare to its spot near the boardwalk just off Newport Avenue and Abbott Street. “Whenever we do a tree, we want to find one that can be donated,” said OB Town Council president Gretchen Newsom, who said the tree’s roots were coming into the house and it needed to be cut down anyway. Even though it traveled just a few blocks, it was quite a journey. Crews came out around 8 a.m. on Tuesday and spent nearly three hours taking the tree down and putting on the back of a 48-foot trailer for the ceremonial ride through OB. The first snag came at Cable and Del Monte, when a few branches had to be sacrificed in order for it to make the left turn. Then a van had to be moved from Bacon Street as the tree neared Newport Avenue, just enough time for residents to come out and snap some pictures. As the tree passed James Gang Company printing store at Bacon and Santa Monica, store managers Paul and Leighann Bearce reminisced about the first OB Christmas tree. As the story goes, the tradition began in the late 1970s (opinions differ as to the exact year) as so many OB customs do: with the James Brothers at the bar. Basking in the glow of the recent successful Fourth of July fireworks on the OB Pier, they decided to bring a tree to the beach for Christmas. “The more they drank, the bigger the tree got,” Paul Bearce recalls. They went up into mountains near Redding and brought back the first tree, with much of the same fanfare as this year’s edition, and a tradition was born. As for our latest tree, it drew rave reviews from onlookers. “That’s really straight,” said photographer Dennis Andersen, who documented the tree ceremony on his website and compared it favorably to last year’s tree. Leighanne Bearce gave it her seal of approval as well. 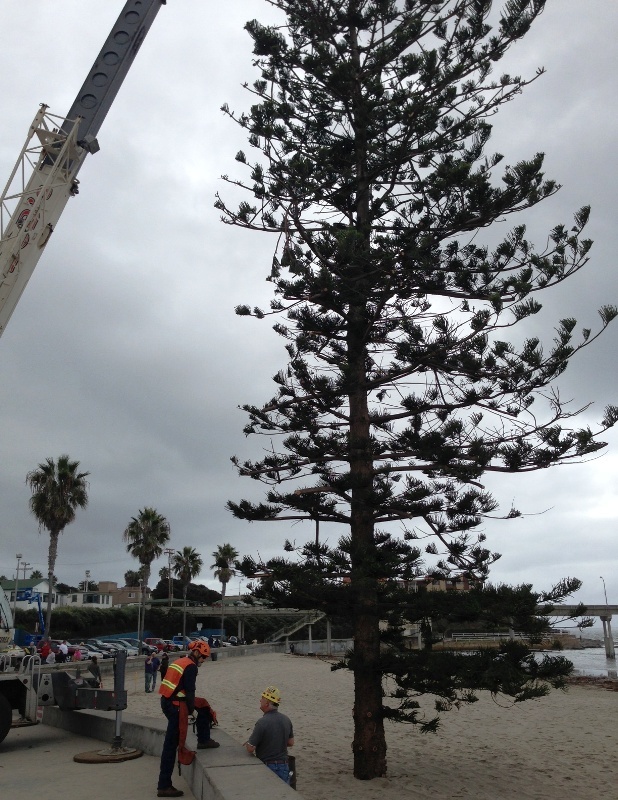 The final snag of the day came when the tree was finally pulled off the truck with a crane and crews realized it was too big for the hole in the beach. But a quick saw job from the workers at Atlas Tree Service, who donated their services along with R.D. Reed Heavy Transport, and the tree was in its new home by 1 p.m.
“We tried to keep as much of it as possible intact,” said Hank DeWitt, of R.D. Reed, which supplied the trailer bed. The tree gets lights put on today. On Thursday, students from Ocean Beach Elementary will take a field trip down to the beach to help decorate. “They’ve been making ornaments for the past couple of weeks,” Newsom said. They’ll be greeted by Santa Claus, who will add the final touches to the tree before Saturday’s Holiday Parade. Then it’s just a matter of waiting before the big man makes his next big appearance on Christmas Eve in just a few weeks. I would very much love to see a Trader Joe’s or some other small grocery chain in the former Apple Tree location. What OB does NOT need is another Rite Aide/CVS type store. It really needs a grocery store. My apologies. Posted on incorrect topic. Thank you. looks like part of the war on christmas. Why do we continue to denude the community by cutting down a tree every year for this reason? This is really ridiculous. Whoops! I was supposed to have a comment before quoting the article above. I’m no fan of cutting down trees either. I think Geoffs concern is a valid one. But I also think this is just one of the more high profile tree cuttings that take place throughout the year. Therefore it gets a lot more attention than say the beautiful tree that was cut down in front of my apt earlier this year. This tree was going no matter what, so why not give it one last hurrah front & center in town. Perhaps we should look at planting additional native plants or trees around the same time. Jon, you may be correct and maybe this tree needed to come down. But, I would prefer not to give anyone in the OB area any extra incentive to cut down a tree and I think a public donation like this kind of does just that. As for the tree you said they cut down in front of tour apartment, was it a City tree or was iron private property. We all have to watch the City, they are too eager to cut a tree down to avoid any maintenance. I agree. There shouldn’t be any added incentive. The tree I’m talking about was on private property and was tearing up concrete, also threatening the neighboring property. A pretty simple call for anyone on either side of that predicament. But sad to lose such a beautiful tree nonetheless. We all felt like we were witnessing the end of The Lorax.